This project involves whole neighborhood revitalization by replacement of 56 two-story, 3-bedroom junior enlisted Cape-hart family housing units constructed in 1957-1960. The existing 56 housing units (8 buildings) were demolished and the site expanded to reduce the high density of units. Replacement construction consisted of variously configured 1 or 2-story multi-unit structures. The design includes wood frame construction, brick veneer, and pre-finished siding. The project also includes garages and patios, as well as supporting infrastructures and neighborhood amenities. Demolition includes UST removal, Lead paint abatement and asbestos floor tile removal. The design effort is being completed on a fast-track basis, through detailed coordination by TJC management team members experienced with design and construction methods. Converting overhead electric and CATV service to underground with pad-mounted transformers. Gas and water mains; storm and sanitary sewers with lift stations. 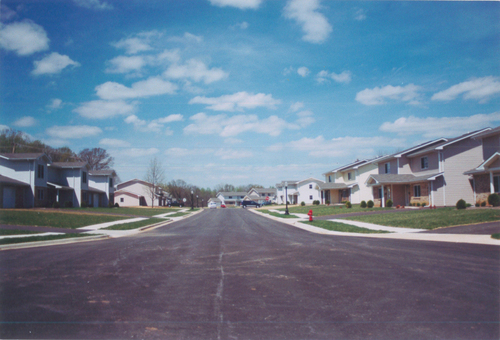 Asphalt streets, concrete curbs and gutters, sidewalks, streetlights.